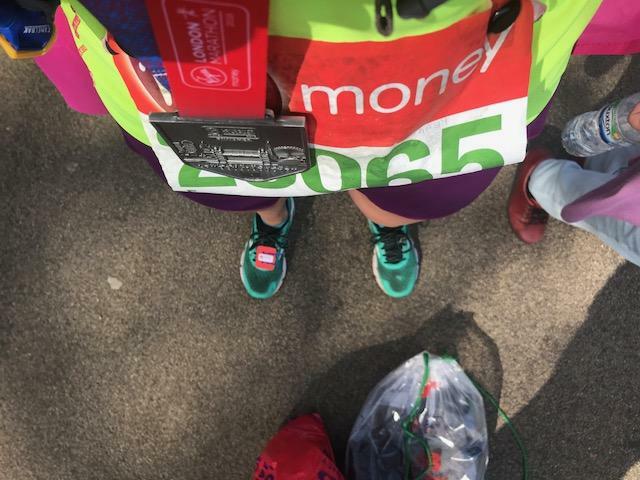 This marathon has been a great achievement for me, but also a really big challenge. 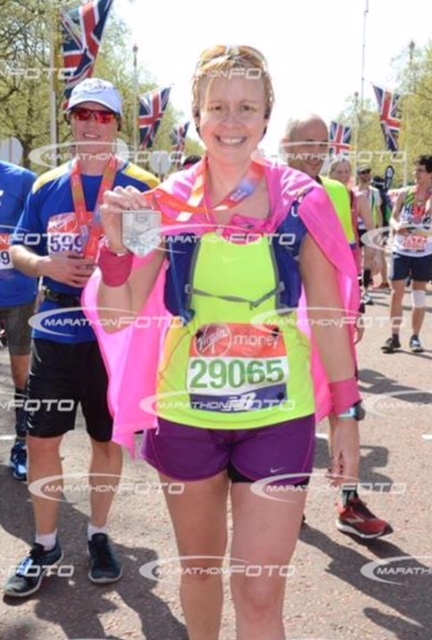 On the day it was my toughest marathon yet, but I gritted my teeth and got through it bang on target. The sense of achievement and empowerment I had after I crossed that line with 3 seconds to spare was almost unreal. 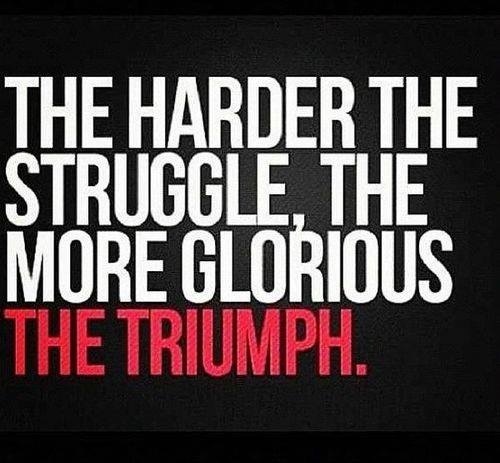 Marathons and races are great – and most things you read about them are the struggles people have overcome, or the great achievements they can be. 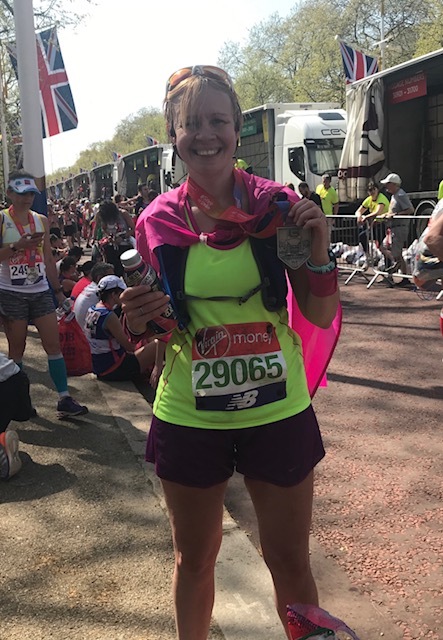 Seldom do you read about the struggles, the pain, and the after effects of running a marathon – the things they don’t tell you happen after you run a marathon. How hard they are and how much they take it out of you. Throughout my training for this marathon (London 2018) I’ve fought with myself over my reasons for doing it, and probably trained too long (16 weeks for this one, compared to 10-11 weeks in 2016). 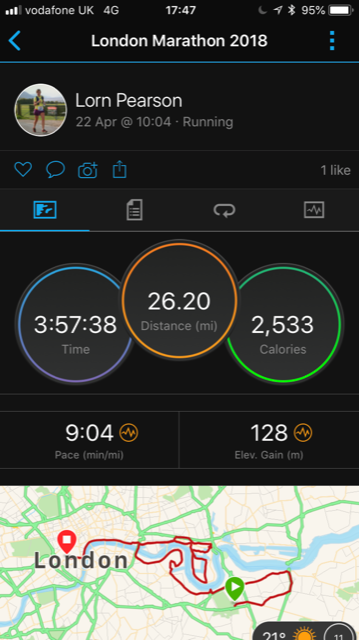 It wasn’t the best of training blocks, but I did about 40 runs, 350 miles and did some good long runs, building myself up to be ready to run 26.2 on the 22 April. 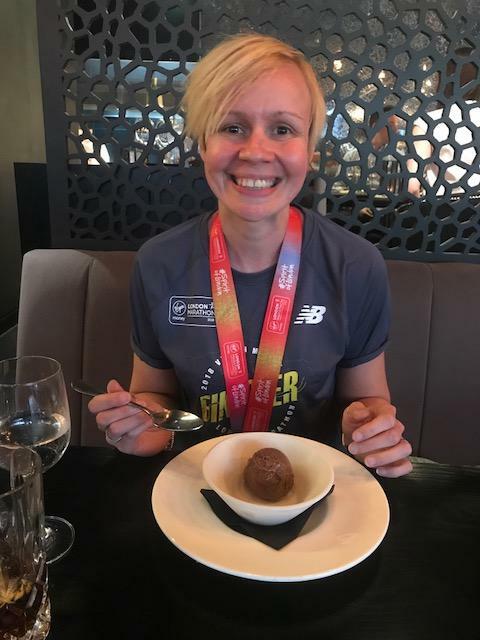 Now after such a hard marathon and tough time, in training, during the race and how I’ve felt after the race… I’m seriously thinking it’s not good for me, and I should give it (marathons) a break for a while (again!). I’ve never gone through child birth, but perhaps it’s similar… you go through all the pain, and recovery, but you get a great wonderful result. As time passes you forget the pain and nastiness and you’re left only remembering the positives. That’s kind of what this (running a marathon) feels like to me (minus the little human being, stitches and stretch marks at the end lol). 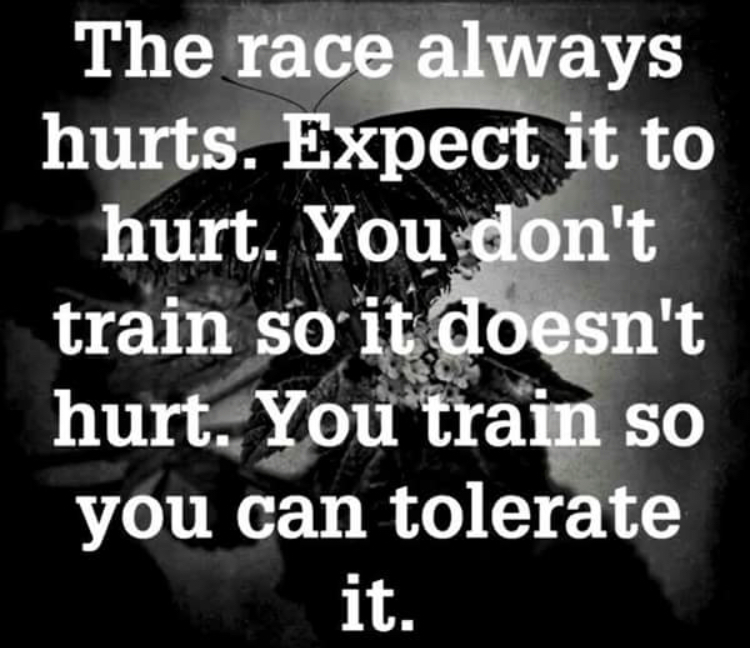 During my training, I had this underlying feeling that running long was bad for me. 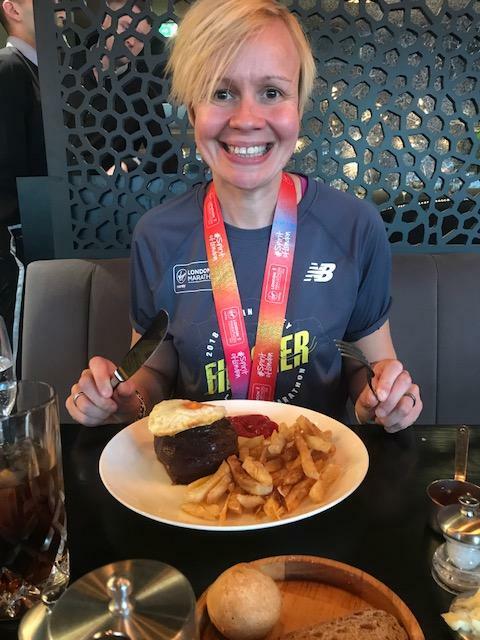 It took it out of my physically just as it had before, but something different that I noticed, was the emotional turmoil I felt the day after a long run. Something I became aware of and accepted, and didn’t let it get to me. Whether it was a caffeine crash, or changes in hormones after the endorphins fizzled out, who knows? But I recognised a pattern, and stopped myself from being down in the dumps on more than one occasion the day after running long. I came off caffeine 2 weeks before the race, and since finishing I’ve not really had it regularly, so hopefully that’ll help my sleep improve. 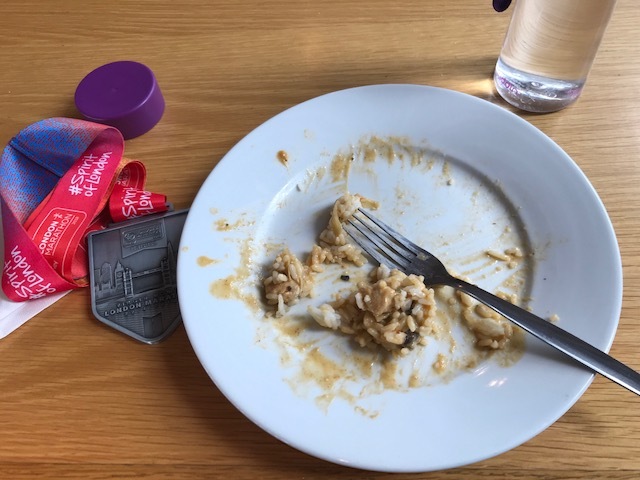 Now I’m going to go through the after effects of the marathon… to remind myself what it is we put ourselves through when taking on the big challenge that the marathon is. 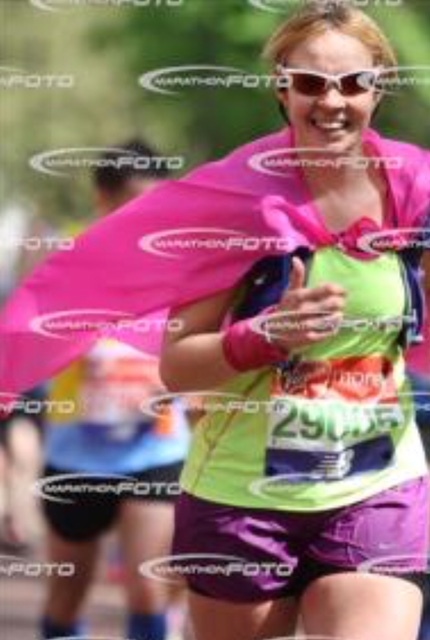 Directly after I finished, I was a bit delirious and very close to having hit the wall. I was hungry from about mile 24, despite having taken on plenty energy (porridge & honey, banana, grapefruit, OJ, sis energy bar, 5 caffeine gels) and plenty water. 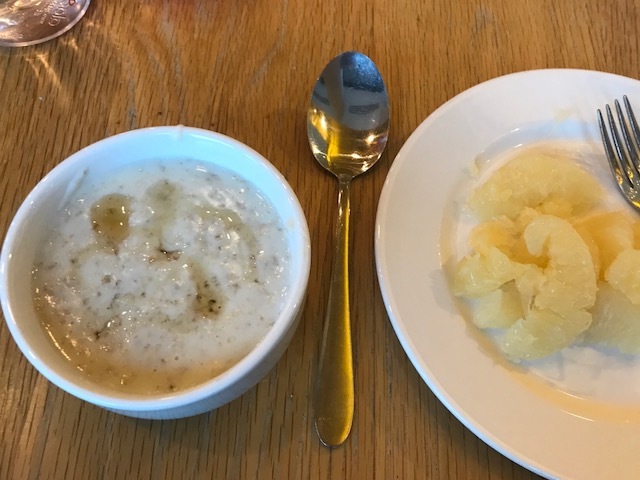 I considered having another bowl of porridge, but decided against it. At mile 24 my tummy was growling and I wished I’d had that second bowl of porridge & honey. That’s only every happened to me before when I’ve run ultra distance – so more than 4.5 hours (and I decided that much running wasn’t for me). 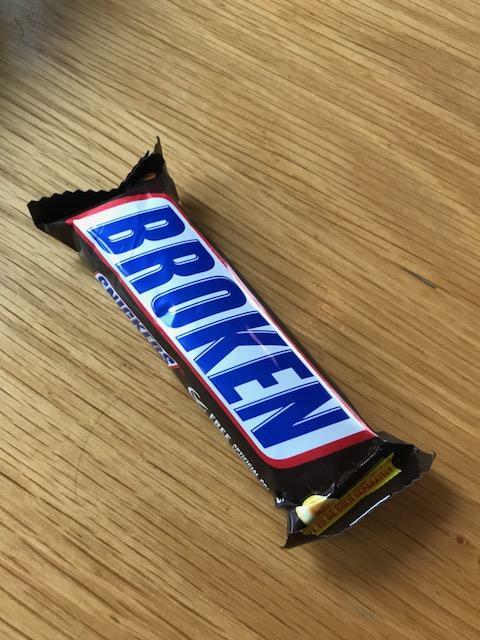 My garmin said I burned about 3,400 calories the day of the marathon – no wonder I was hungry (even though I ate and drank plenty). My brain wasn’t working properly and I noticed it especially when I tried to look to where to pick my bag up from the lorries and couldn’t figure out where to go. My brain just wasn’t working, and was probably due to being empty of energy to power my brain cells. Sunday, after the race, I felt totally spent but full of achievement and pride (not to mention caffeine and endorphins!). I got in the shower and realised my lower back was chaffed pretty badly, from either my shorts or my water pack… so that was fun / screamy. AAAYYYYAAAAAA! It healed over the following week, but wasn’t very pleasant. My vision was blurry, but my muscles weren’t too sore… like they were still in shock at what I’d just put them through, but they were still working. In prehistoric times, maybe that would’ve to keep you able to keep running from the big bear chasing you? Keeping your body going for a day or two until you were safe to recover. I had a bit of a sore neck, and things were starting to get sore, but not too bad. I was on such a high, it was great. My big toes were sore on the first couple of days, but that pain eased off quite soon. No blisters, my feet appear to be used to the repeated pounding and I have good supportive trainers. Even my plantars felt ok thankfully (having experienced pain them before after previous marathons). 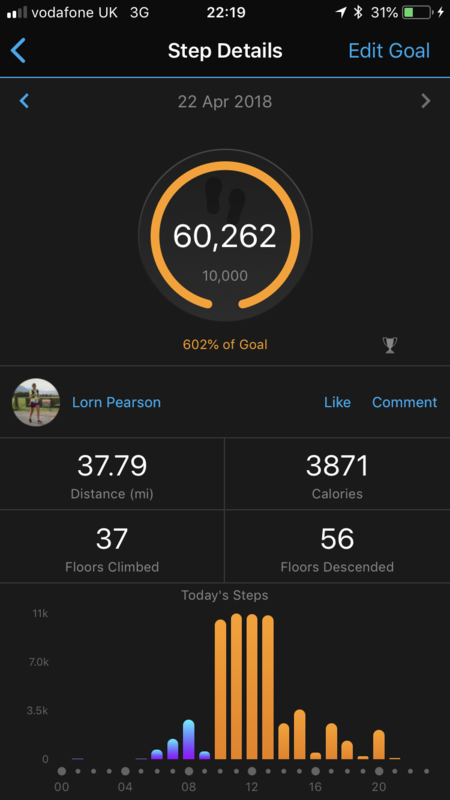 On Sunday I did 60,000 steps, including 50,000 for the marathon. The walking before and after must have been good to help me stretch off after the marathon. Sunday night in bed, I was lying, my whole body throbbing. I’d taken ibuprofen, but I’m not sure what good it did. I couldn’t sleep, but I didn’t even mind. Hot and throbbing, everything was hot and my mind wouldn’t turn off. I tried everything. I was still lying awake at 2am and I could hear the crowds cheering in my ear. Earlier on I could also feel my sunglasses on my head and my cape touching my shoulders, long after I’d taken them off. Strange. That night I managed to get some sleep between 3-5am and probably rested a little, but still felt fine and pretty amazing and high in the morning. Blame those endorphins and probably the caffeine too. My mind was working on over drive, unable to stop thinking after the overwhelming and noisy and encouraging atmosphere for a full four hours – non stop. Monday morning (day 1) I had a good shower and stretch, and still I didn’t feel too sore. I’d walked a lot after the run (50,000 steps on the run, 10,000 steps before and after the run). I was a little sore, in the arches of my feet, my quads, lower back, shoulders and my elbows (of all places – must have been that sprint for the finish line lol)… but I felt pretty good still. 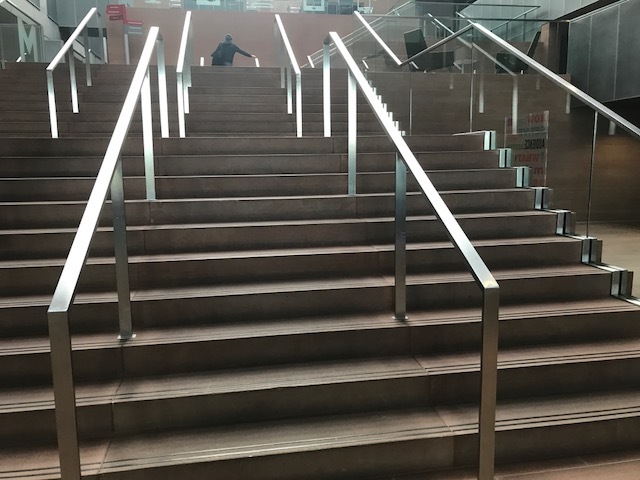 Even stairs were ok. I did quite a bit of walking that day too, about 10,000 steps to and from train stations. Plus a 5 Hour train journey where I got up and walked about and stretched numerous times. In the station before we left I noticed my vision was still blurry – annoying but understandable given what I’d just put my body through the day before. 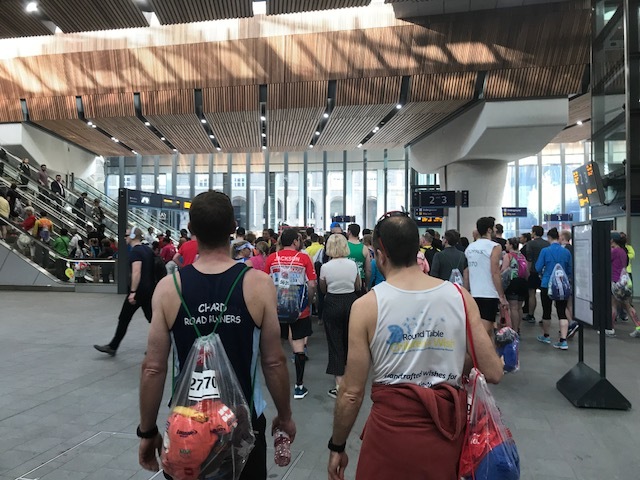 I still had a massive sense of achievement and revelled in speaking to other marathon finishers at the station before we left to go our separate ways. I felt tired but didn’t sleep on the way back up – I was still wide awake and probably still a big high. 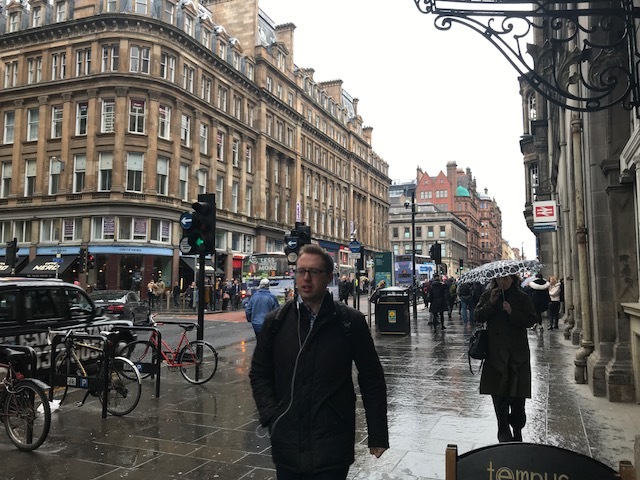 I got to Glasgow and back to the rain and comparative cold and walked half an hour home dragging my bag along on wheels. I took my time, but hoped the walk would do me good. I got home, and right there and then it all hit me – the pain, the tiredness and the after effects of running for 4 hours with my heart rate at 88% of my max! My high appeared to have departed. I managed to stay up til about 9pm, catching up with Fit Girl, then went to bed and got an ok sleep, from 9-1, then from 3-7 – 7-8hrs. I woke in the middle of the night, just about everything in intense pain and needing stretched off. So I went downstairs and did some stretching and drank some water. I was still very dehydrated. I’ve been eating and drinking plenty since I finished. I’ve really noticed that I’m really thirsty so have been making sure to take on plenty of fluids. (Despite having 1.5 litres of water in my back pack, about 6-8 small bottles of water on the course and 1-2 litres afterwards). Tuesday (day 2) I was due to be back at work and I unfortunately had a busy day where I’d be greeting people in for interviews, showing them where to go, and catching up after being off on Monday. 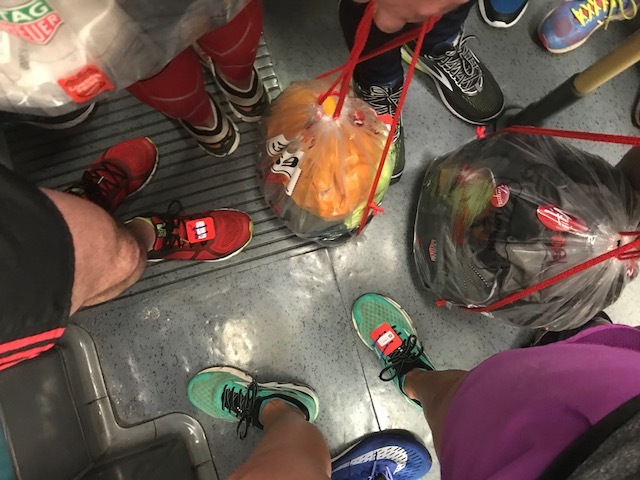 Before I woke on Tuesday morning I had the strangest dream where the run had made me mentally ill and made me hallucinate… at work, no one was helping me, but everything was going all pear shaped in my vision and mind. Very odd. But lucky it didn’t happen in real life that day. I went to work early as needs must, and the day went well, but it was long – from about 8am-7pm. The interviews went well, then I helped make sure an event was set up at the end of the day. All good and in a days work. A couple of days later I was sitting at my desk thinking – I love this job… which can’t be bad. 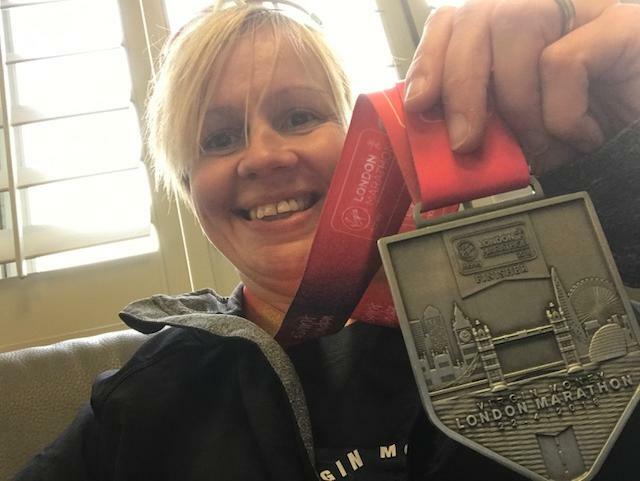 Work on Tuesday meant quite a lot of walking – 14,000 steps… and I probably added to that by going to people and showing off my medal / sharing with them how it went. A lot of them had sponsored me, and I was keen to let them know how I’d got on. I didn’t get back on those stairs properly until about Friday. By day 2 I was really sore. My quads mainly, but also my back and calves. I was speaking to people, standing up, and feeling sweat on my back… feeling a tiny bit light headed at times, probably my body putting up with the nearly all over pain. It was bearable, but not much fun, and the ibuprofen I’d taken with breakfast which probably would have helped. I must have bitten the inside of my lip as I was running as I had a sore bit which was starting to heal. I don’t remember doing it, but I guess that’s what grit and running a hot hard marathon can do. And on Sunday night I noticed blood in my urine – that’s never happened before, but a sure sign that I’d pushed my body and needed to recover now. I drank lots to hopefully clear it, and it was back to normal before I knew it. On the morning of day 2, just after waking up, I was taking my stairs at home 1 step at a time. It was not good. I planned to take the lift every time I went up or down levels, and I did mostly, but sometimes I just went back into habit, or walked with someone else up or down stairs. Day 2 DOMS are the worst. Tuesday I was careful to eat plenty and had a big lunch from the canteen, a full meal. I had a good breakfast too, some snacks and a good dinner. Plenty of water… and two lots of 800mg of ibuprofen after I’d eaten (5 hours apart). I’m not sure how much good it did. I was getting lots of congratulations and nice comments and thoughts from people, and I was feeling ok, but tired and sore. Still, I felt a bit like a rock star. Lol. I had my medal in my back pocket and showed anyone who asked / cared. I got home after a long day at work, and had an early night 9pm, and slept a good 9 hours (with no crazy dreams). Wednesday (day 3) and I woke nice and bright at 6am after my good sleep. Still a bit sore I went into the Garagym and did some stretching and foam rollering – 20 minutes. 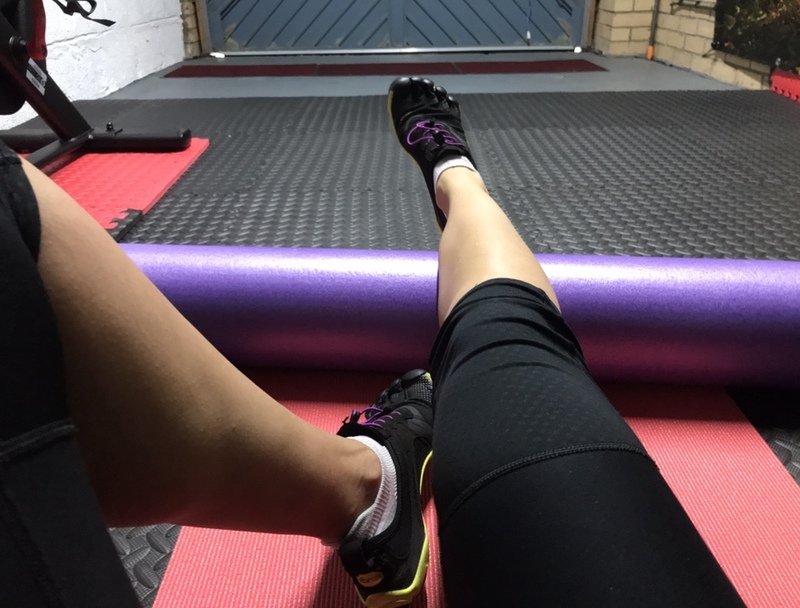 My main sore bits were just my calves and quads… but going over my it bands with the foam roller was agony – isn’t it always? Hopefully it’d be worth it. That was the day the tiredness hit. A big bold wave of fatigue… I made sure to eat and drink plenty and took my walk to work pretty leisurely. I took regular screen breaks and had a good big plate of lunch – chicken stroganoff. In the afternoon I opted for a can of coke for the sugar and boost. The pain seemed to be wearing off, but the tiredness was here good and proper. I felt really tired and like I was struggling to be myself. Every time I got up I was sore, and I felt lacklustre, unmotivated and like I just needed to have a wee lie down / afternoon nap to recover and get back to being me. Thursday (day 4) and my legs felt like they were getting back to normal. I still wasn’t considering a run, but it was good for them to finally feel almost human again. 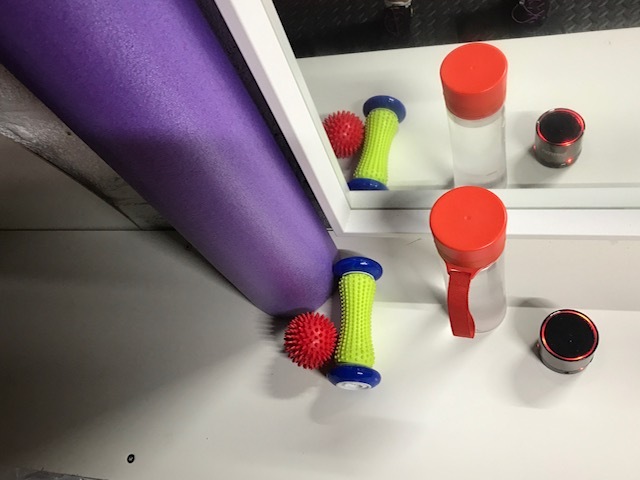 I got up a little early again and went to stretch and foam roll, just 16 minutes this time, but my legs were almost feeling back to normal which was good. Still the tiredness persisted… but my vision was getting back to normal, and my body seemed to be starting to forgive and forget what I’d put it through. I have a book about rest and recovery, and it suggests a days rest for every mile you race. That’d be 26 days… or nearly 4 weeks, but I usually take about a week, then ease myself gently back in. 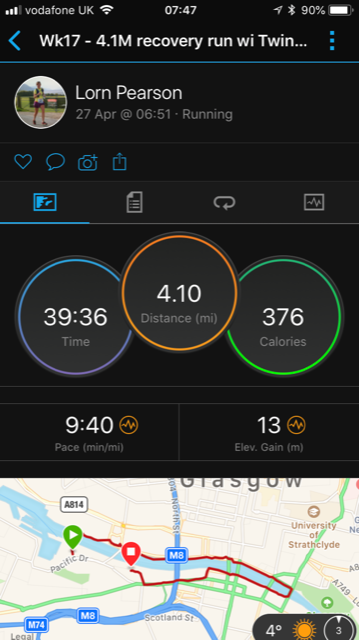 After 4 days, my legs felt back to normal and I decided I’d try a wee easy run on Friday morning (day 5). My work Twinnie invited me for a run, and since I felt ok, I thought I’d give it a try. Starting running I felt ok… then as the run went on I felt my left leg didn’t feel quite right… it didn’t feel injured, just not fully recovered. Sore left calf / quad and hip flexor. And my back felt quite tight too. Still it was good to get a nice wee easy run and chat on a nice morning. During the marathon, I managed to stave off what felt like cramp coming on in my left calf at about 19 miles in, then a few miles from the end I felt it coming on in my left quad. I’ve no idea how I avoided it, but I did. If it had come on I’d have had to stop and stretch, but I managed to keep going ok. My left leg now deciding to remind me that running marathons can be bad for you. I don’t think I can blame it on running too soon, more than I could blame it on simply being an after effect of the marathon. I managed to stave off the cramp mid run somehow, but now it feels like I’m paying for it with this. Great fun. I’ll stay off running for a bit longer now, and get a massage on Wednesday (day 10), then see how I feel. In the meantime I’d test it with heat and ibuprofen. Now instead of getting better each day, I’m in pain whenever I walk. It’s very frustrating, even a little upsetting. Last week my body was able to run for 4 hours and do 60,000 steps in a day, today it’s complaining at walking a short distance. It’s a good way if my body stopping me and making me rest – so I’ll listen to it and rest. Saturday and day 6, another early stretching and foam rollering session. Another lot of ibuprofen with breakfast and another with late lunch. 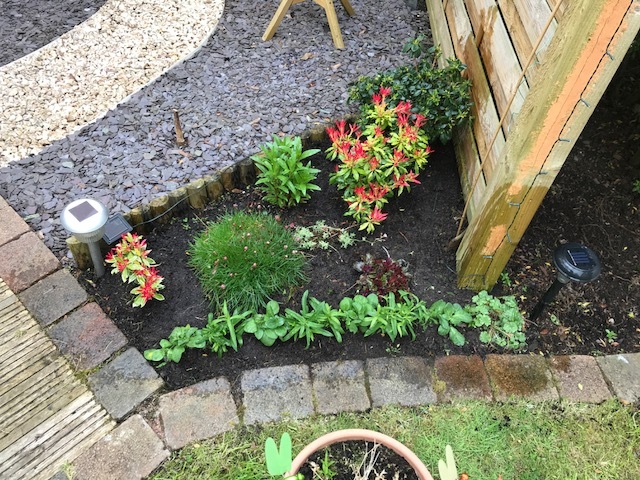 Some gardening and then a nice easy walk, and there wasn’t any pain in my hip flexor anymore. It could be the ibuprofen, it could be the stretching. I’ll keep my eye on it and make sure I get enough rest, sleep and recovery before running again. Hopefully this hasn’t depressed you too much reading it. 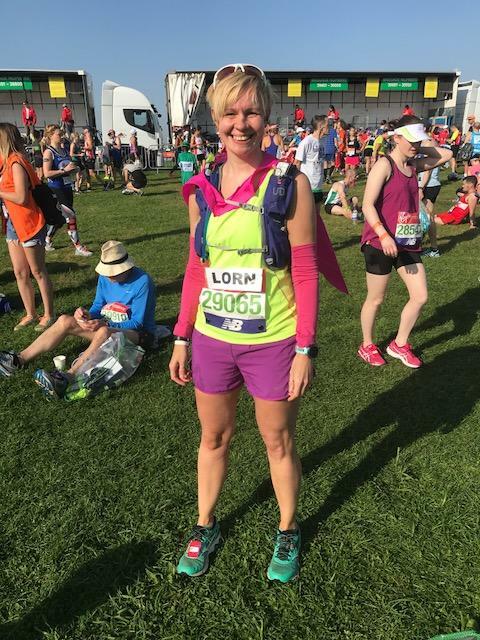 It’s a true reflection of how hard marathons are on us, what it does to us – body and mind – and why it’s really important to train for and recover well from them. I still feel a really great sense of achievement having done this, the other 5 marathon events and other 5 marathon distances I’ve done. I might do another, I might not, but for now I’m on the mend and looking forward to what’s coming next. 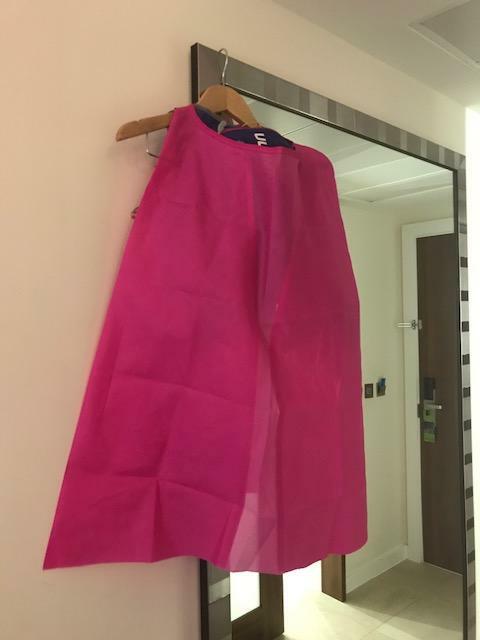 My pink cape disintegrated and is in the bin, but it’s ok, I’ve got my real cape, tied on tight, waiting for the next chapter. I’m sure I’ll be back to being ‘Super Lorn’ soon. Then who knows what I’ll get up to. Good article. Yes, marathons hurt by mile 26.